Indian Bank PO Scorecard 2018 released! All the candidates who appeared for Indian Bank PO Prelims exam 2018 can now check their marks obtained in Indian Bank PO Prelims from the direct link shared below. The result of the candidates has been shared earlier by the Indian Bank. Go through the link provided below and check your Indian Bank PO marks 2018 obtained in Prelims exam! 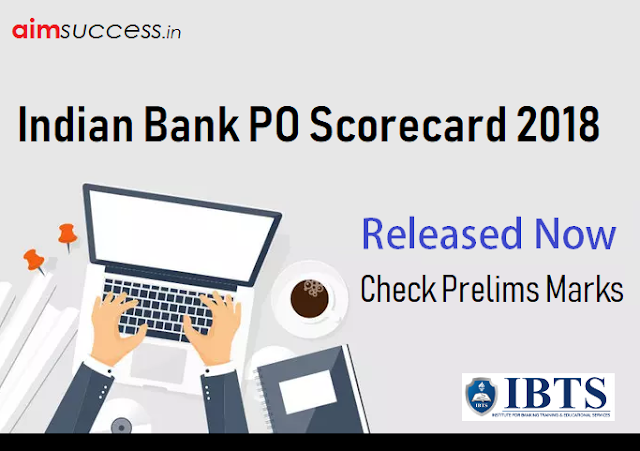 Indian Bank PO Prelims Scorecard 2018, Check Marks! How to check your Indian Bank PO Prelims Marks 2018? Alternatively, you can go to the official website of Indian Bank and go to the recruitment section there. On the screen which appears, enter your roll number or the registration number. Then enter your date of birth in the format mentioned or your password. Click on submit after cross-checking the entered details. Your Indian Bank PO Prelims 2018 sectional and overall marks will be displayed on the screen.